Illinois bilingual education rules and regulations provide specific guidance on how to identify English language learners, place them in the proper educational program, monitor their progress, and transition them to the general program of instruction. Is a language other than English spoken in your home? Does the student speak a language other than English? If the answer to either question on the HLS is YES the school must assess the child’s English language proficiency using the appropriate English language proficiency screener to determine program eligibility within 30 days of enrollment. HLS responses must be entered into the SIS to continue the process for new student enrollment. The completed HLS with parent/ legal guardian and school official signatures must be filed in the student’s cumulative folder. Illinois School Code 23 Illinois Administrative Code 228 require that schools administer an individual English language proficiency screener to students identified through the HLS as coming from a family where a language other than English is spoken. All kindergarten students who have a YES answer on the HLS must be screened with the Pre-IPT (EC) Model (K-1) or W-APT (1-12), regardless of their ESL status. Results from the screener will determine a student’s eligibility for and placement in a bilingual/ELL education program. Only staff members who meet the certification requirements can administer the English language proficiency screeners. For students qualifying for Transitional Bilingual Education in grades K-2, a Spanish Language Proficiency Screener will be administered to further determine program selection. Families indicating on the HLS Spanish as the other language spoken in the home will have the option to have the Spanish IPT screener administered for placement in the Spanish Bilingual TBE program. Student scoring in the areas of Limited Spanish Speaking (LSS) or Fluent Spanish Speaking (FSS) will be considered for the Spanish Bilingual TBE program. Students scoring in the area of Non-Spanish Speaking (NSS) will be referred to ESL services based on their English Language Proficiency Screener. 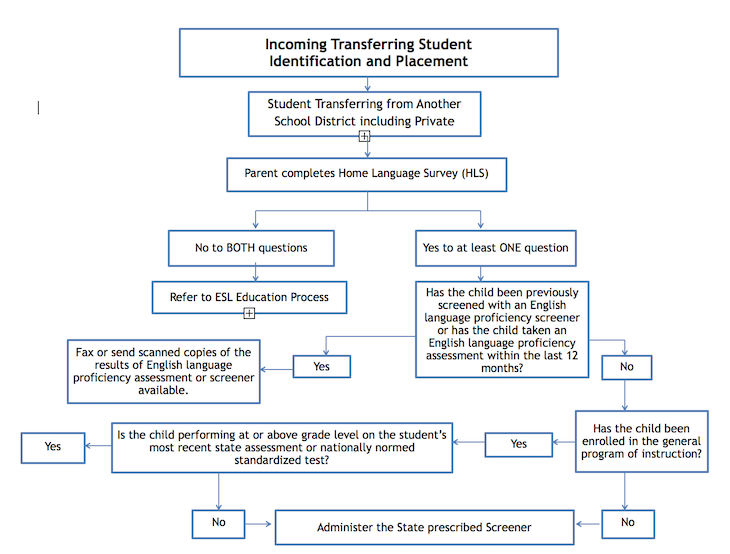 Every student who transfers into Batavia Public School District 101 and is identified via the HLS as coming from a home in which a language other than English is spoken, must have his/her English language proficiency assessed using the appropriate screener. If the student has an English language proficiency screener administered by another school district and the results are not older than 12 months, BPS101 will use the student’s overall performance on the screener to determine the student’s placement in a ESL/Bilingual education program or the general program of instruction. Refer to the “Incoming Transferring Student Identification and Placement” chart on the following page. If the student has taken an annual English language proficiency assessment at another school district or state and the student’s score is not older than 12 months, BPS101 will use the score to determine a student’s placement in a bilingual education program or the general program of instruction. Refer to the “Incoming Transferring Student Identification and Placement” chart on the following page. Has been performing at or above grade level in reading and math on a state test or nationally normed standardized test provided that this test was not administered with any EL accommodations. If a student has a screener or English language proficiency assessment score from another school district that is older than 12 months and it is the most recent score, the screener must be administered by BPS101 and entered into SIS. The overall performance on the screener will identify the student’s English language proficiency level for proper placement in a bilingual education program or the general program of instruction. Refer to “Incoming Transferring Student Identification and Placement” chart for further information. Article 14C of the Illinois School Code and the No Child Left Behind (NCLB) Act of 2001 require that schools notify parents/legal guardians of their child’s placement in a bilingual education program within 30 calendar days of enrollment at the beginning of the school year and 14 days thereafter. English/Spanish versions of the Parent Notification Letters are available in the handbook appendices. Versions in multiple languages can be found at www.olce.org. Conduct an in‐person/phone conference with the parent/legal guardian to explain the benefits of the bilingual education program services and discuss the child’s English language proficiency level. Inform the parent/legal guardian that the child must be tested annually with the English language proficiency assessment until child attains the state‐set English language proficiency score. If the parent/legal guardian still refuses placement upon completion of the in‐person/phone conference, he/she must submit a written request to the school and the school must complete the Refusal form. The school’s bilingual lead teacher (or principal’s designee) must fax the parent’s/legal guardian’s written request to waive bilingual education services together with a Refusal form to OLCE at 773.553.1931. All parent refusal request documentation must be filed in the student’s cumulative folder. The bilingual lead teacher (or principal’s designee) shall place the student in a general program of instruction classroom per the Refusal form and parent/legal guardian written request. The ESL teacher must inform receiving teacher that the student’s parent/legal guardian has refused bilingual education services and provide the student’s English language proficiency level. The parent/legal guardian can request that their child be reinstated in the bilingual education program at any time, as long as the child has not met the state exit criteria. The school must receive a signed written request from the parent/legal guardian and a completed entrance procedures. 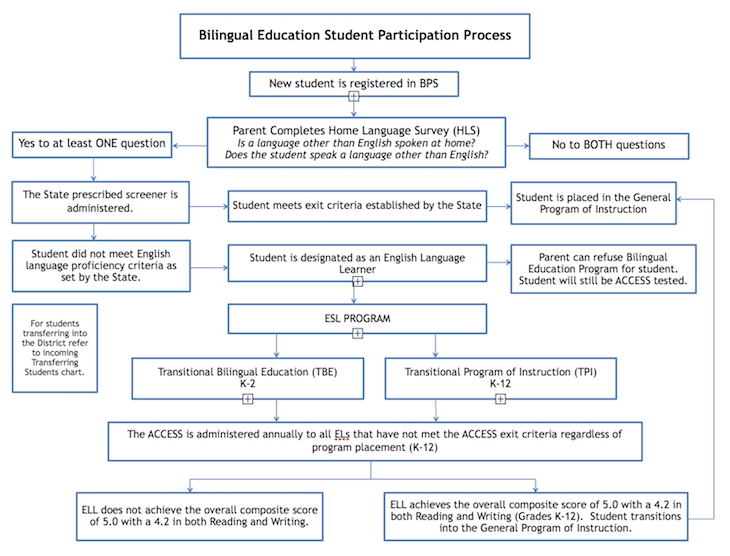 The bilingual lead teacher (or principal’s designee) is responsible for confirming that the students whose parents/legal guardians have refused Bilingual Education services are properly coded in SIS. When students have transitioned to the general program of instruction, they will be identified in SIS under “alerts”. This report should be used by administrators and teachers to identify recently transitioned students and address their instructional needs. Academic progress of transitioned students must be monitored for at least two years. It is strongly recommended that principals provide ELs transitioned into the general program of instruction the same opportunities to attend extended‐day support services as the general program of instruction students.